The third most expensive spice of in the world, cardamom, known as the ‘’queen of spices’’, is surpassed only by vanilla and saffron in its price per unit weight. Just a little bit of cardamom will do impart its unique flavor to any dish. In its native land, India, as well in other parts of Asia, it is a common ingredient in cooking. Surprisingly, it’s also used in baking sweetbreads and other desserts in Nordic countries! These days it’s increasingly being used to flavor tea and coffee. Cardamom enjoys a sufficiently long shelf-life; but here’s a word about how to store it: its strong taste and intense aroma are best preserved in its own pods; grinding and exposing them quickly makes them lose flavour. 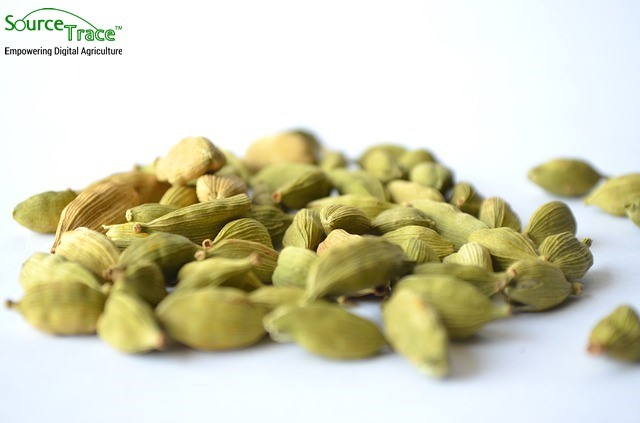 Cardamom comes in two primary varieties – the smaller green and the larger brown. The green cardamom is a native of the western ghats of the southern Indian region, and it is believed that cultivation of cardamom initially began in this tropical, humid zone. The brown cardamom, on the other hand, is native to Eastern Himalayas and mostly cultivated in Eastern Nepal, Sikkim, parts of Darjeeling district in West Bengal and Bhutan. Yet, the first reference to trade in cardamom comes from Sri Lanka, where it is still grown on a small scale in the highlands. Both the brown and green varieties are used in flavourings and as cooking spices in food and drink, and also in the preparation of various medicines. It offers a whole range of health benefits: from gastro-intestinal protection and control of cancer to relief from cardio-vascular issues, improvement of blood circulation and detoxification of the body. In India, was one of the ingredients in Ayurveda and traditional Chinese medicine. It is rich in various vitamins and micronutrients too. Until the 20th century, India was number one in production and export. But since the year 2000, Guatemala has taken over this prime position. Though it isn’t a native crop here, the Malabar variety had been introduced by German coffee planter Oscar Majus Kloeffer even before World War I. Over time, the cultivation of this cash crop picked up in Guatemala. Though hardly used in the local diet, it became an important foreign exchange earner as well as a crop suitable for smallholder and especially women-led households, for whom it is the only cash crop. The annual yields averages at 25,000 to 29,000 metric tons. The major exports are to the Middle-east, and a small percentage to the European Union. Thus, for Guatemala, cardamom is green gold. And at second place, India’s annual production is about 15,000 metric tons. But then, quality matters too – and being an expensive spice, Indian cardamom trades at nearly double the price of Guatemalan variety, which is also facing its share of problems. These problems include sloppy growing practices, pest infestations and fluctuating international prices. The best time for planting cardamom has been during the monsoons, around June-July. Light drizzles and cloudy days make for an ideal planting situation. The crop is best manured with organic fertilizers like compost or cattle manure. The plant starts bearing fruit in the second or third year of plantation. The fruits mature at a 35-45 day interval, with 5-6 pickings required for the total harvest. Normally, the harvest season is from October to November. An average yield from a well-grown plantation would be 450-500 Kg per hectare, with actual yields varying according to soil type. Indian cardamom, that occupies place number two in terms of world production, would have fallen further, had it not been for a new variety that was ‘developed’ by an individual farmer in Kerala. About 20 years ago, farmer Joseph Sebastian, from Kerala’s Idukki district practically changed the face of cardamom cultivation in Kerala. Owner of a 1.5 acre piece of farm, it was an accidental discovery that triggered the turn of events. Joseph had set up an apiary on his farm, thinking of bee-keeping as an additional means of income. The bees cross-pollinated different varieties of cardamom plants and his idea was born watching them do that. Isolating varieties that had emerged from cross-pollination, he made a note of each of them. He then counted the output from these plants in terms of cardamom pods. He further separated these high yielding varieties and cross-pollinated them. Within a decade of such experimentation, he was able to develop a variety that produced 120-150 berries compared to the 30-40 of normal varieties. He gave this variety his family name Njallani. On examination of this variety, the Indian Cardamom Research Institute confirmed that it yields more than traditional varieties. Joseph also came up with a radical way of growing cardamom. Instead of planting seedlings and waiting 3 years for the first crop, he planted shoots cut from the high yielding variety. He discovered that the first crop could be harvested after two years. B. Sreekumar, Economist and then Deputy Director of Spices Board, had commented that the lives of growers in the region changed after cultivating the Njallam variety. As the yield was up to 1500 Kg per hectare, the farmers’ standard of living had improved. Of course, the cultivation of this variety requires assured irrigation and good land management practices. Yet, this increased yield has helped India retain its position as the second largest producer in the world. A cordial bilateral relationship has been established between the world’s two biggest producers – Guatemala and India. The former took the lead in consolidating this partnership. From this partnership has emerged the opening of the Embassy of Guatemala in New Delhi, officially established in 2014. India established its resident Embassy in Guatemala in 2011. Guatemala’s primary objective is to build the country’s presence in Asia to explore new business opportunities, investment and cooperation. And so, the queen of spices initiates a diplomatic tie. Coupled with bilateral partnership, internal distribution and trade opportunities within India are also round the corner. In order to develop alternate marketing systems that bypass the often disturbed cardamom auctions, the Spices Board is offering new trading platforms for farmers. Cardamom growers in Kerala, Tamil Nadu and Karnataka are being provided an opportunity in the forthcoming India International Trade Fair at New Delhi to market their produce in the potential north Indian market. The Board will be setting up cardamom theme pavilion at Pragati Maidan from November 14-27, 2017. Cardamom growers are being initiated to participate in the event.